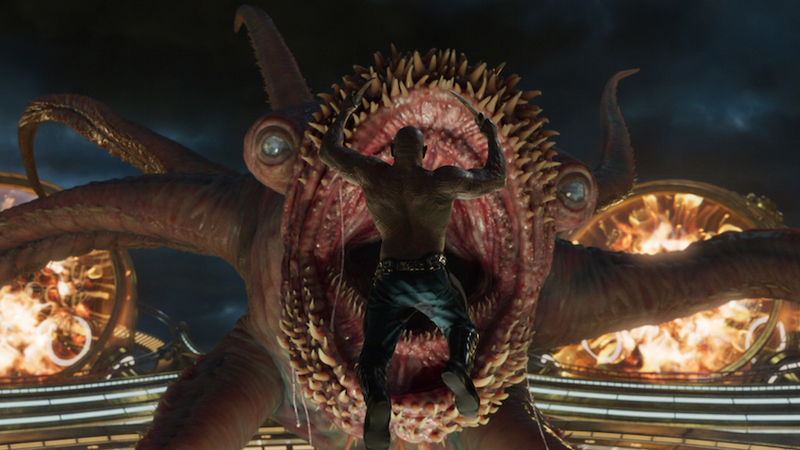 What’s the one thing Guardians of the Galaxy, Marvel’s 2014 deep space adventure, is missing? That’s right, Kurt Russell. Fortunately for everyone, writer/director James Gunn’s follow up, Guardians of the Galaxy Vol. 2 rectifies that oversight with a vengeance. Oh yeah, and there’s Baby Groot, who may be the most adorable character to ever grace the silver screen. For all the folks who claim Marvel’s movies tend to follow a standard formula and wind up a bit same-y, the cosmic side of the MCU continues to be a welcome shot of something fresh and different. Guardians of the Galaxy Vol. 2 doesn’t do much to differentiate itself from its predecessor, but the sarcastic, candy-colored, rock-and-roll-fueled exploits of the rag-tag group of interstellar misfits and outlaws is a total blast and is a worthy successor. And though it’s not too distinct from the first film, Guardians 2 is still unlike most of Marvel’s output—this includes Doctor Strange, which, while visually stunning, is basically just another generic origin story about a rich white dude with questionable facial hair. Plot wise, there’s a ton going on in Guardians of the Galaxy Vol. 2. We pick up with the gang—Star-Lord/Peter Quill (Chris Pratt), Gamora (Zoe Saldana), Drax (Dave Bautista), Rocket (BradleyCooper), and Groot (Vin Diesel), who, after their last misadventure, is now like six inches tall and just the cutest damn thing—selling their services to the highest bidder in true mercenary fashion. After doing a job for Ayesha (Elizabeth Debicki), leader of the snooty, gold-skinned alien race the Sovereign, the team runs afoul of her and pretty much everyone else they encounter. There’s also some inter-Ravager conflict going on for Yondu (Michael Rooker) to contend with; romantic, will-they-won’t-they undertones between Peter and Gamora; Nebula (Karen Gillen) still figures into the program; and then there’s Kurt Russell as Star-Lord’s long-lost father. Don’t worry, that last one’s not a spoiler, we learn that in the very first scene. Again, it’s the dynamic of the core cast that drives Guardians of the Galaxy Vol. 2. This is where the humor, the momentum, and even the heart all derive. Every player puts up a harsh front that hides an inner fragility and emotion. Pratt’s surface cockiness masks his deep scars and longing for family. 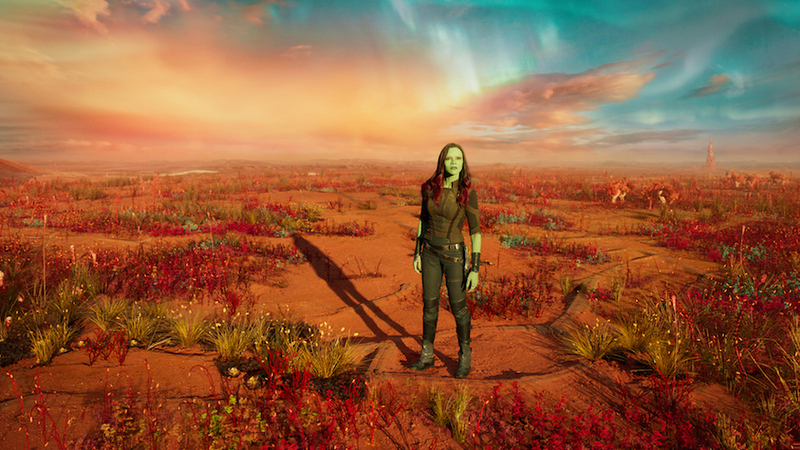 Saldana’s Gamora has a thick uncaring, impenetrable exterior where only glimpses of her newfound feelings for her off-kilter clan flash through. Rocket masks inner pain and loneliness with sarcasm and violence, and Cooper once again balances that bravado and delicacy. Boisterous and overly literal as always, Bautista’s Drax is even more entertaining this time around, but for every bellowing belly laugh, the former professional wrestler infuses the Destroyer with a lingering sadness over his long-gone family. 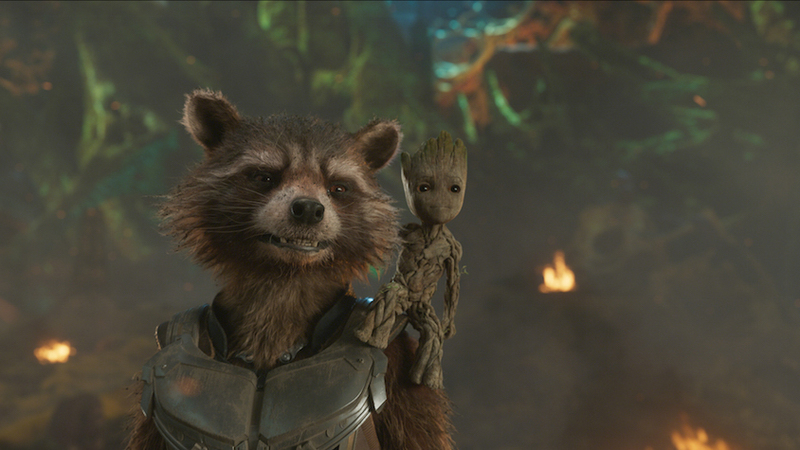 Even Groot, a diminutive CGI tree, has moments that yank the heartstrings. It’s a couple of background players from the first movie that may actually give Guardians of the Galaxy Vol. 2 the biggest boost. Yondu steps up from his fun-but-stock antagonist position and fully dives into the father figure role, and Rooker’s gruff pathos occasionally breaks a heart or two. 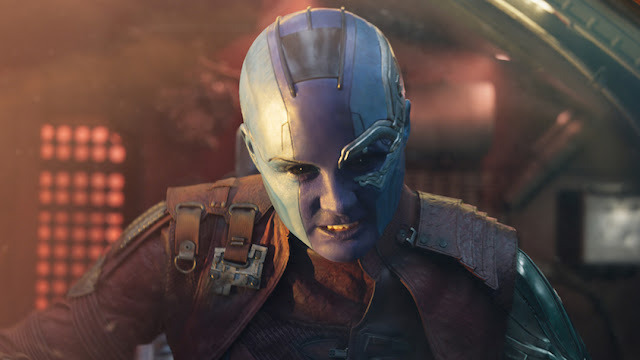 And while Nebula was a moderately interesting foil as Gamora’s adopted sister, this time around she’s a fleshed-out character, with emotions and motivations that extend beyond surface revenge. And for the love of god, can someone please get Karen Gillan more lead roles? That would be lovely. Hell, even Kraglin (Sean Gunn, the director’s brother) has a legitimately affecting emotional arc, which I certainly didn’t expect. For all the swashbuckling high adventure and galactic shenanigans, the idea of family forms the core of what Guardians of the Galaxy Vol. 2 is really all about. New cast additions like Mantis (Pom Klementieff), Ayesha, Taserface (Chris Sullivan), and a few others best left unmentioned, as well as a handful of new alien races and far-flung planets, open up the Marvel universe even further. But those relationships sit at the center. 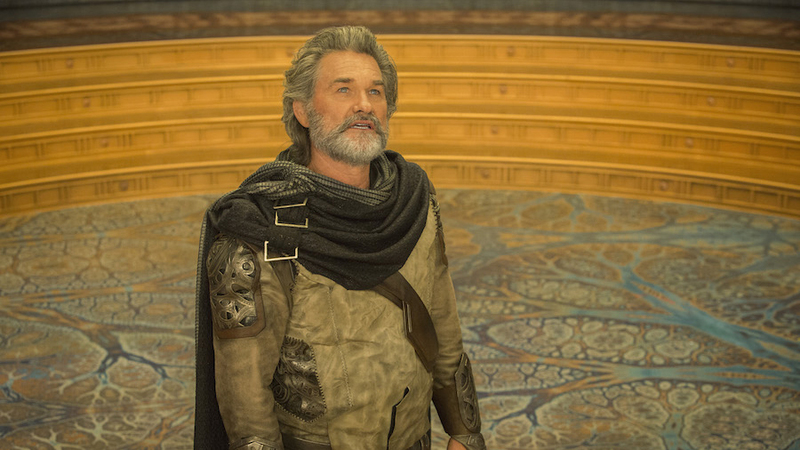 Kurt Russell is obviously the most notable addition, and fathers and sons are front and center—at one point he and Star-Lord have a catch, which is delightful. But the family concept reaches far beyond that one relationship. Blood family obviously plays a big role, but the narrative encompasses ideas of the families we choose and that choose us, adopted families, siblings, nuclear families, and just about every other iteration imaginable. They’re not always what we see, not always what we expect, and too often we don’t even realize what we have until they’re gone. And James Gunn wraps all of this ooey-gooey, hug-it-out feelings time in a bonkers visual spectacle, making full use of the 3D and IMAX technology. The camera soars through the depths of space, sweeps across entire worlds, and Gunn takes almost maniacal pleasure in flinging arrows and ships and shrapnel at the viewer’s face—which I maintain to this day is the best use of 3D, immersive worlds be dammed. Whoever looked at movies like Slither and decided to give James Gunn all the money to team up with the Weta Workshop and make insane, over-the-top movie creatures should be considered for sainthood. Beyond the sheer aesthetic mayhem, Gunn and director of photography Henry Braham (The Legend of Tarzan) have a damn good time playing around and finding inventive ways to stage the action. One early scene where the Guardians tussle with a many-tentacled space beast plays out almost entirely in the background, out of focus, as the camera follows Baby Groot in an extended take. I was also worried that Baby Groot was just going to be a cute add-a-kid type of prop that would wear out its welcome in short order, but good lord, I’d watch a movie of just him. The little guy is funny and charming and ridiculous and sad and so much more than I thought was possible from a diminutive anthropomorphic alien shrub. The success of the first wasn’t unexpected exactly—the Disney-backed Marvel marketing machine wasn’t about to let a movie fall through the cracks—but it was something of a risk, one that paid off big time. They took on a lesser known comic property, with in a vastly different setting and little overt connection to the rest of the MCU, and the two biggest stars at the time only appear as the voices of an angry raccoon and a talking space tree with a three-word vocabulary. Now that audiences know these characters, and the actors all have much higher profiles, there’s a wider fan base on which to draw. Basically, Guardians of the Galaxy Vol. 2 is less of a gamble. And it doesn’t take any additional undue chances. It knows what it does well and does exactly that. 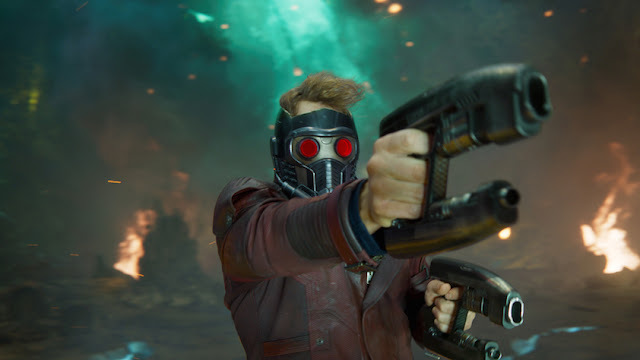 By and large, it’s more of the same: it’s chalked full of quirky moments, like Gamora pausing in the heat of battle to wave at Baby Groot; and the “Awesome Mix” soundtrack is once again full of classic rock jams, even if a few choices are a bit on-the-nose—really, Cat Stevens’ “Father and Son”? It works, and I guess it’s slightly less obvious than “Cat’s in the Cradle,” but damn.